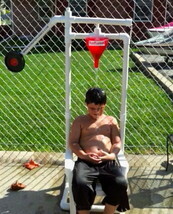 Less expensive and safe alternative to a Dunk Tank. Perfect for fundraisers, rentals, churches, schools, park districts, camps, boys girls club, any party, company picnics, special events and backyard fun. Built to last with durable PVC material, portable, easy to assemble, takes minutes to setup Draws a crowd. Clean fill of water, holds up to 5 quarts of water! Assembled in the U.S.A. *Also check out the Soak 'n' Wet by KO Water Games for all ages and a BIGGER SPLASH! 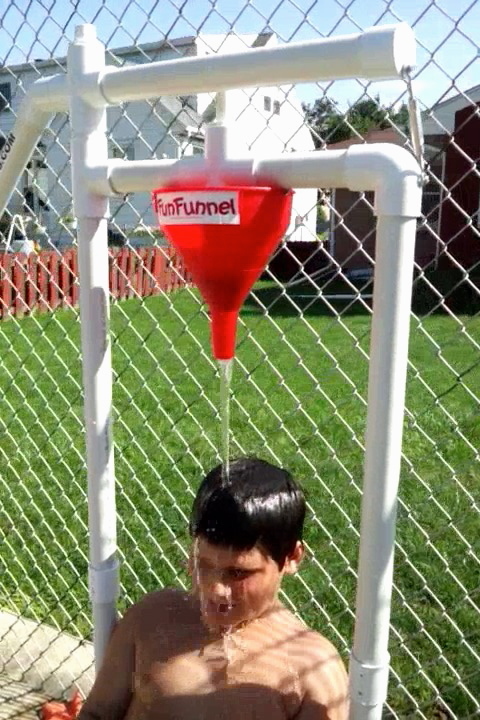 The Fun Funnel is a new water dousing game for children of smaller ages. It is safe and for the price it's cheaper to buy rather than renting a Dunk Tank. It breaks down into a small box. Easy to transport and store. No wrenches or screw drivers needed. It's built to last. Made from durable PVC plastic. Mechanism comes altogether, only assembly needed is the frame. Once the target is hit watch as water is gently dropped down onto child. Fresh water every time! Holds two quarts of water. Have a fun backyard water dousing game for the hottest of days. Comes with Three 5'' squared vinyl bags. 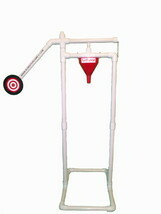 Pellet filled. Chair not included. Easy to set mechanism. Use under adult supervision. Also check out the Soak 'n' Wet by KO Water Games for all ages and a BIGGER SPLASH! If you have any issues upon delivery or questions please contact KO Water Games since customer service is very important to us. Assembled in the U.S.A.